It was through social media that I connected with Lidia Varesco Racoma after the 2011 conference via her blog and twitter. I was keen to hear how the recent addition of her first baby has impacted her business and creative directions. She has evolved her re-branding of her blog as ‘Biz-Mama’ and had asked if I would be interested in doing a Q & A interview which I loved to see the tables turned on me per say. But in true collaborative fashion I really felt her story needed to be shared as well. So we followed up with a video interview and distance aside, her sweet demeanour paired with her passion for her job and family are quite contagious. One of the things that I just love about what can come out of simple conversations are insights and ah ha moments. Below is a tid bit about how our combined love of ‘print’ design created from what I could tell a new design term: tactile design. There is digital design, interactive design and yes print design, but print never really summed up the unique description of creating something that you can touch which relates to all things print, whether wearable, signage, products, etc. It was because of a session about product design at HOW in Chicago in 2011, that was part of her inspiration to start her own side-business called Type Baby. I love how she was comfortable to connect with the speakers that inspired her as well has how the other creatives she kept in touch with since her first CFC conference. If there is anything that epitomizes the benefits of making the effort to attend conferences that bring similar people together is to encourage community and therefore a professional respect, especially when it comes to our industry. A few interesting insights about Lidia, if you have a chance, check out her Typography in the City personal book project that was inspired while she was wandering the city streets walking her new baby around town. While chatting I also learned that Lidia’s husband is also a creative who she actually hires out as a consultant when she needs the extra help. In fact he has invested in Type Baby. Talk about a true partnership. Then we got talking about how the new addition to their family had impacted her work expectations. I loved to hear that the realities of having a small child around doesn’t allow for productive time to work. As well the work process has changed from being ‘organic’ and do it as it comes, to being more scheduled because time and responsibilities need to balance. Part of this contributed to her need to find an office space outside of her home. Her previous set up had her using a room in her house, but the kid booted her out. One of the bonuses of using an outside office space is the ability to focus on the workload without being distracted by things going on around the home. It helps her to be more aware of her schedule and not overwork yourself past creative burnout. Lidia has some great thoughts on what she has learned in the past 12 years of her business. Definitely something worth checking out! She is planning to make it to HOW this June 2013 in San Francisco. I am looking forward to meeting her in person. So if you plan to make it out – keep an eye out for this cute and bubbly creative with a passion for type! Thanks Crystal for the fabulous write-up and video snippets! 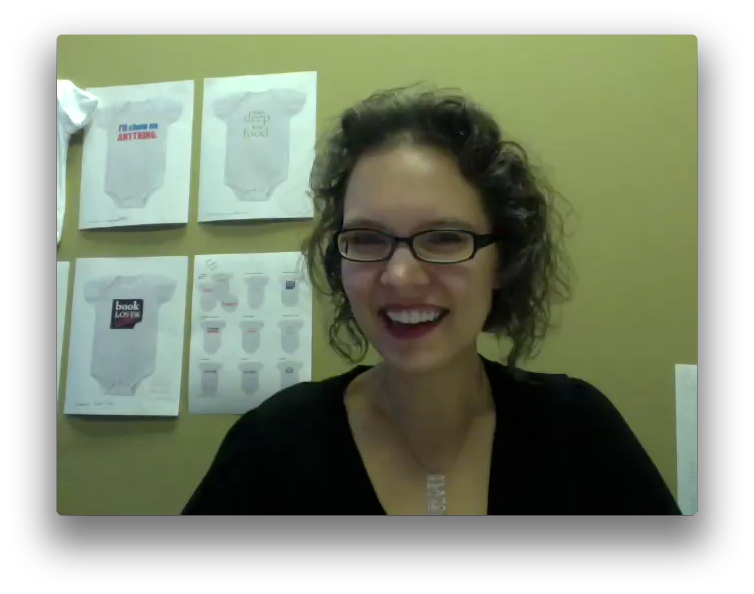 I enjoyed reading your “biz mama” insight for my blog, so I loved our video chat. I appreciate you sharing my typographic- and baby-inspired projects! Really glad you liked it… Count me in on the old school movement too!